If you’ve kicked off 2019 with the ambition of a leaner, fitter, healthier new you, we’ve got it all mapped out with dozens of stores lined up and waiting to help you achieve your goals. Feed yourself for the body you want with health foods and supplements at stores like Grape Tree, Holland & Barratt, Herbal Green and Savers or opt for a healthy lunch at Sushi Mania, Subway, Boswell’s Café, Greggs or Mooboo. 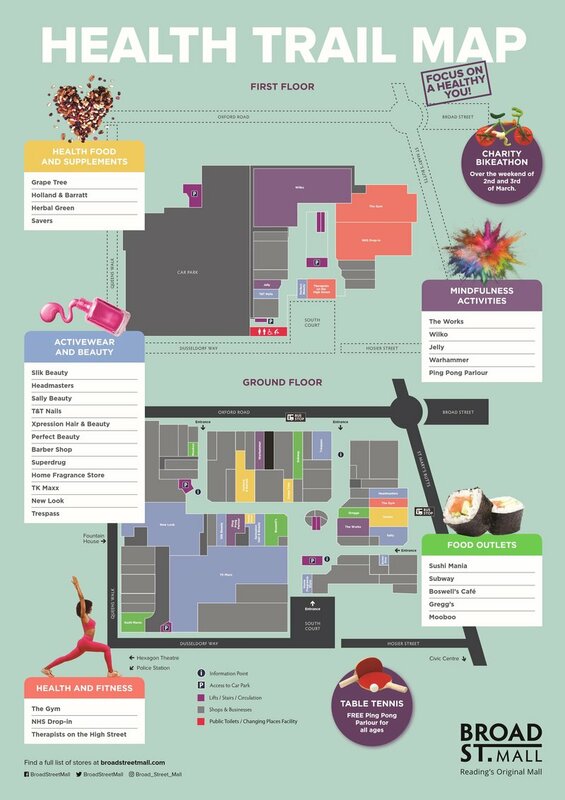 Get your health and fitness regime on track with The Gym, Therapists on the High Street and the NHS Drop-in and give yourself a little TLC with Slik Beauty, Headmasters, Sally Beauty, T&T Nails, Xpression Hair & Beauty, Perfect Beauty, the Barber Shop, Superdrug and the Home Fragrance Store. For all your activewear needs, head to TK Maxx, New Look and Trespass. Take some time out with mindfulness classes from Jelly and fun activities from stores including The Works, Wilko and Warhammer or have a go at some FREE table tennis in our Ping Pong Parlour. Check out our handy health trail map across to find your way from store to store.